One of the best parts about my recent class up in Vermont is that I was given the opportunity to be a part of a professional process from start to finish. Making cheese at home is a definitely a rewarding experience, but depending on your level of expertise and milk source, there might be a question as to the final product. I work with the highest quality of milk that I can, but that can vary depending on what is available. At Mt. 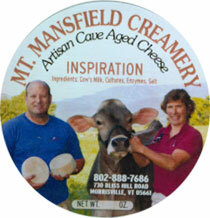 Mansfield, they milk their own herd of Holstein and Brown Swiss which provides a constant within their recipe and process. Time and time again both Peter and Stan say that the quality of the cheese you make is determined on day one. Being a part of the process from the beginning gave me an insight as to what it takes to make a high quality cheese, time and time again, such as the “Inspiration”. This is a washed rind cheese that is made from a Corsican recipe. The molds that develop on the rind are apparently very typical of this french style. After the rind develops, Stan washes the outside with a beer from the local Rock Art Brewery. I was immediately impressed with how thin the rind was. It shows how carefully he treats these cheeses as they are washed and turned on a regular basis in order to promote even development. The nose gives off a subtle smell of bread or “yeast” due to the beer, with a fresh smell of milk from the actual interior. The paste is very dense without being dry. I would liken it to the texture of an aged goat cheese, but there is quite a bit more moisture here. My favorite element is the mouth-feel… This cheese coats your tongue and won’t let go. The rich and creamy texture coupled with the overtones that I can only liken to rising dough, gives this an incredibly long, unique, and delicious flavor. I enjoy the cheeses that Stan makes at Mt. Mansfield, but the Inspiration is definitely my favorite. If you have an opportunity, this should definitely make your list of cheeses to try. The cheese produced by Mt. Mansfield Creamery in Vermont is the best we have tried. Not only fresh but it has the right drieness, not too creamy and tastes like the cheese you can obtain in the Scandinavian countries.Right n !!!! !